It all started with Andi. In 1997 we went on a trek at the Vermont Icelandic Horse Farm. By the end of the trip Steve had fallen in love with his horse, Andi, and much to Andrea's surprise Steve decided that he didn't want to leave without him. The fact that Andi was not for sale didn't stop Steve. Although Andi didn't come home right after the trip, after nine months of incessant begging and pleading by Steve, Andi became ours. 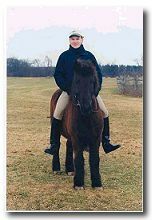 When he joined us at age 18 we soon began to realize that Andi wasn't just any horse. Andi was simply a one in a million horse. He was extremely wise, and always a complete gentleman. Anyone, could ride Andi - and almost everybody did. From people who have never been on a horse before, let alone tolting out on the trail, to experienced riders who were impressed by the speed and power of an old "pony" Andi had the unique ability to sense the level of the rider and dapt immediately. 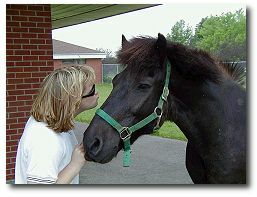 Although, not the most handsome or affectionate horse, Andi's charm and proud, quiet nature built him quite a fan club. Throughout his life he was a wonderful ambassador for the breed. 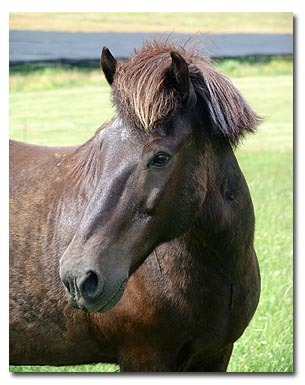 Andi spent his last golden years retired at The Icelandic Horse Farm in Vernon, BC Canada. There he enjoyed summers in large pastures free from summer eczema along with other Icelandic seniors. Then in the fall of 2007 it became apparent that his life was coming to a close and he needed our help to move on. He passed peacefully in October of 2007. Although he is now gone Andi is still very dear to our hearts. He will always be our favorite. We are honored to have known such a special friend.